In its fifteenth iteration, the Emerging Scholars’ Forum invites scholars and the public to look back on Canada's celebration of its 150th birthday in order to debate the future of Canada and Canadian studies. In particular, though not exclusively, we would like to acknowledge the different and complex ways in which Indigenous voices have responded to the sesquicentennial, which some critics renamed Colonialism 150. At stake is the larger question of reconciliation, the (de)construction of a national and historical master-narrative, the colonial character of the Canadian government, as well as the legitimacy of the Canadian state. How has Canada responded to the challenges of reconciliation? What kind of nation-building discourse did, and still does, Canada create and how does it affect Indigenous peoples? What is the role of academics in all disciplines of Canadian studies in the reconciliation and continuous nation-building process? What does allyship look like in 2018 in academia and beyond? First and foremost, we would like to acknowledge and honour Indigenous scholars and knowledge keepers, who have made some of the most significant contributions to Canadian studies in recent years. Every day, Indigenous voices reclaim historical narratives, question settler values and perspectives, present alternative understandings of kinship and community, and contribute invaluable knowledge to all academic disciplines. 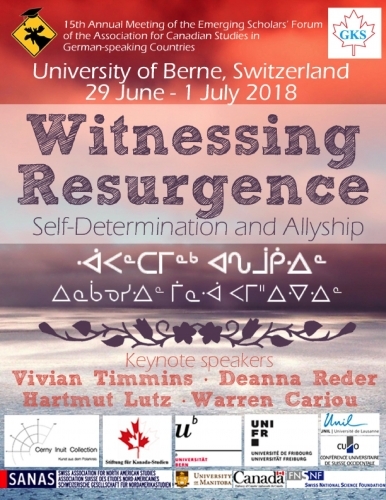 We are thrilled and honoured to announce Warren Cariou (Métis, University of Manitoba), Deanna Reder (Cree-Métis, Simon Fraser University), Hartmut Lutz (Professor Emeritus, University of Greifswald), and special guest of honour, Vivian Timmins (Mushkegowuk Cree, author, Elder) as our keynote speakers. While our keynote speakers will address Indigenous studies, the Emerging Scholars’ Forum strives towards intersectionality and interdisciplinarity and welcomes papers from all fields of Canadian studies. We welcome contributions on cultural, historical, political, environmental, economic, and social counter-narratives as well as on the multiplicity and cohabitation of various voices within social justice movements. Moreover, we are invested in the possibility of decolonizing academic methodologies and encourage interrogations on ethical research practices. Please find attached the preliminiary conference programme as of February 2018!